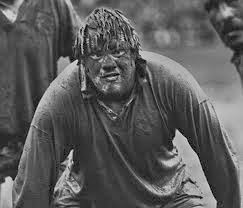 29 November Anniversary, and Much Mud. Today is Steve's anniversary. He died on the 29 November 2007 at 10am, and so I went to Pagham Harbour Nature Reserve to do something to mark the moment. I mean this in a most healthy way, I was not meaning to go to the estuary and lie down in tears wearing my best wedding frock and let the tide wash over me. I wanted to celebrate and remember, and feel good about our time together. The landscape that most holds the memory of Steve for me. I cycled to Pagham Harbour Nature Reserve a few days ago, only to find that it is the most beautiful place on earth. I left the bike chained securely to a flimsy and unsafe old footpath sign, hoping that any bicycle thief would find it too difficult to cycle off with my bike dragging along behind it a weather beaten sign with a wooden finger pointing up into the sky saying This Way. Enjoy Yourselves. This landscape above reminds me of Steve, it is the kind of place in which I imagine his spirit is happiest. Steve loved the sea, he loved boats and he loved silence. Sometimes I thought he was only on loan to us, his place was far, far away from the bustle and noise of life. One night, I caught him looking up into thousands of stars in the night sky, as he stood in his garden looking over the hills and fields, and I was struck with the knowledge that he was on loan here. His place was amongst the stars. I had the same feeling when I saw him in places like this, with the ebb and flow of the tides, the birds flying overhead and only the silence and power of nature. Me and Steve, on loan to us for a while. This morning, I put into my bag two bright tulips from a bunch that dear Alan had given me, some stones from the garden, some pieces of paper and a pen, and some matches. Leaving the bike chained again to the old battered wooden sign at the Harbour, I walked along the mud and sand banks, trying to keep to the path, through the puddles as the tide was out, until I found a piece of the estuary in which I could create a little ceremony for us. I wanted to be ready at 10am, the time that he died. And so, at five minutes to ten, in a little spot amongst the sand and pools of water, I sat on a bit of grass and wrote on the paper, wishing him a happy anniversary, and thanked him for everything. I wrote a good few notes and letters to him, with thoughts and news of my life, and hopes for the future. I told that I loved him, and I asked him to keep looking after me. As the wind was blowing fiercely off the sea, burning the letters wasn't possible, and so I left a circle of stones with the two red and white tulips in the centre as a memorial to us, and went off looking for somewhere to build a little cairn and burn the letters. I found a space eventually in some overhanging branches at the side of the estuary. It was lovely inside, like a mermaid's cave, with bits of seaweed hanging off the shrubbery around me. In my little cave of branches, I sat on the sandy floor and built the cairn with the stones and rocks around me, and I burnt the letters, one by one, warming my cold hands by the tiny fire. A robin red breast joined me from nowhere, and hopped from branch to branch only inches from my head, watching me and the fire with tiny beady eyes. I spoke to it gently, telling it things about Steve, and explaining what I was doing. It wasn't afraid of me, and stayed on a branch listening intently with its little head on one side. We watched the fire die down, the robin and I, for a long time, in mutual companionship. When eventually I decided to go, the robin had gone. I had not seen nor heard it fly away, it was just gone. The tide was coming in as I walked back. Without knowing the landmarks and not recognising where the path was, I found myself walking in the wrong bit of the estuary, into the sand and mud, and wham. Over I go, my boots stuck in the sand, sinking fast and I sprawling in the mud making a right old mess of my coat, hat, gloves, tights, face, hair and nice white jumper. Righting myself somehow and pulling out my boots in my stockinged feet, and realising that if I spent more than a half second at a time in the mud I would sink and join Steve amongst the stars, I waddled as best I could over clumps of seaweed that would be safer to stand on, and arrived back eventually to the bank. I looked like a creature from the black lagoon. I had weeds in my hair, thick mud coating me, my clothes, my face, and up my nose. I put my boots back on, displacing the mud inside with my feet, and squelched back to my bike. I was wet, a few stone heavier with the mud, and very very cold. This is all because of you, Steve, I thought. I hope you're satisfied. Last time I get sentimental on your anniversary, I felt like saying. Next year, I shall have a cream tea in a comfy hotel and think of you there. Me coming out of the mud. Not really, but similar. I rode home in style. Today is the first day for my new lodger in the house, I wanted her to feel at home and safe on day one, and so I hoped she would be out when I arrived. Of course she wasn't. She was standing by the door. 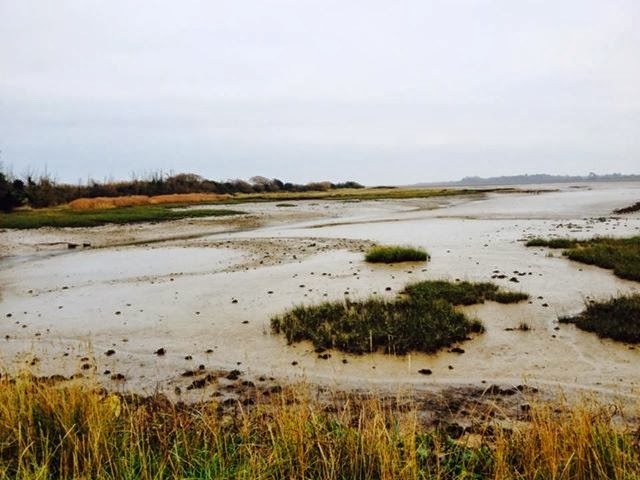 When I said that I had fallen in the water and mud at Pagham Harbour, I could see that she thought that I was one of those odd posh arty types you read about. "I do it all the time!" I could have said, picking seaweed from my teeth, "I like to jump into the quicksands at the estuary when I feel low, it always makes me feel better! Gives one perspective!" and she would not have been surprised. I am feeling better this week. We have only one day left of November, and it is common knowledge that December will be my month. It will all be lovely again. November has been ghastly, and so obviously if November ends, it will end the ghastliness too. Simples. I am consolidating my 2013 by not making any intentional decisions until day one of 2014. I am sitting back and waiting. I am waiting to see what happens. Instead of me going out to get things and do stuff, I am waiting for stuff and things to come to me. Nice stuff and things, in December only nice things happen. I am chilling, chillaxing, watching, thinking, pondering, and taking notes. Life is too short, I read, to be always on the go. Fine, I say, I shall be on the stop. I am in transition. I am in a limbo. I am filling the empty vessel that is me, with time off and lots of nothing. Actually, decisions will be made, they will happen when I am not looking and I will be pleasantly surprised that I have made them while thinking of something completely different. Happy in my blanket in the kitchen gazing at the iPhone as Giant Boy plays me some of his French Rap music and I am reminded that I do not know what is going on and need more time. To end now, on a happy note, I am going out with Alan tonight to the poshest of dinners at Amberley Castle. We are dressing up, having bubble baths and putting perfume behind our ears (mostly me doing that) and ending the month of November in style. From Shrek yesterday to Elizabeth Taylor today. Roll on December. On My Soul Calling an Experience for my Good. We call to ourselves experiences that we wish to have for our growth. Some say that there is no coincidence, there is only that which we create for ourselves. We don't know on a conscious level much of which we cause to happen for our own growth, but deep inside, somewhere under all the cobwebs and the layers of self doubt and worry, our little souls shine like supernovas longing for the chance to experience all that will make them grow, and shine brighter, and cause us to move on and up in our worlds. The experiences that we cause for ourselves are often difficult to understand. Why would our deeply buried souls require unpleasant things to use for their growth? How could our weeny little supernovas attract badness for our benefit, and how are we to understand and use these experiences so that we become wise instead of plotting revenge and ways to have the last word? Don't know, is the answer. I called to my soul, over the last few months, an experience that I cannot regret but I do not understand. It is over now, though my heart hurts and my soul is trying to calm me, telling me that it is all for the best. One day it will be clear, says my soul, that this was important and I learned much from it. I would rather not, I say to my soul, life was going so well before you needed this experience. Ah, says my soul, what have you got from it already? I have got a glimpse of the power of love and life. I took a risk, I did what Brene Brown calls daring greatly, and I agreed to go to places which were so seductive and wonderful, and at the same time, filled with danger and harm. I accepted all of that, and followed my heart and soul into the arena, where I have done battle, and come away bloodied, sad and wise. But while I have been trying to keep myself safe during this time in the arena, in order to carry on from day to day, the door that was closed into my creativity, opened. See, says my soul, I sent you something to work with when this experience tuned sour. Use this, all of this, this powerful emotion, this seemingly random madness, this deeply felt confusion, and make it work for you. This is what I can do for you, and you will be better for it. Now, I am consumed with feelings. I have not listened to music for many years, not wanting to have to address anything that would shake my resolve to be calm, to get on, to be safe. Now, I am lost in music, lost in feelings, lost in feeling unsafe. I want to feel my chest hurt, and I want to pour into it all the music that I can, I want to experience the feelings of loss, and power, and love, and misunderstanding, I want to feel the whole darn lot. I want to write poetry, and create things that make others gasp and say, "Lord! What turmoil! How I feel it too!" I want to dance outside in the mist in a nice dress, and have someone film it so that the result is so full of meaning that everyone that watches it says "Aaaah. Mysteries, and life, and boy she must be lost in something big, and blow me down, but I am lost in something big too now ". A still from the film I have not made yet, and this is not me, obviously, but it is as mysterious and full of unknowable feelings as one could wish for. It is a photo of my troubled older son who has been locked in his own turmoil away from me, for however long it takes for him to come through and come back. So having his photo as a still for a film not made, about his mother's turmoil, seems fine. The day that I closed the door on the experience was the day that the true fairy painting decided to be painted. It was wonderful. The wood on which she is being painted was primed, the paints were all ready, I knew she was wanting to come. I started to try and find her by painting her. She changes and evolves each time I go back to her on the easel, she moves on, and manifests a different mood. I am intrigued as to who I will find when I have finished painting her for that moment. The true fairy will tell me that I am fine, and that I did the best I could. She will tell me that she is from inside me, she is me, she will always be me. For this, I am very grateful and as the dust settles, and time passes, I am beginning to rest a little and feel that I am safe again. Sad, but safe. And now I have the gift of the painting of the true fairy. She could not manifest before, but she is in league with my soul, and has agreed that now is the time to make an appearance. It was necessary, she says as I am painting her, you couldn't see me before. I am here because you needed to find your feelings again, and you needed to come out of yourself, and want to make a film about you dancing in the mist in a sparkling dress to music, you needed to want to find a way to make me real so I could come and see you. The true fairy aged one. Fey, delicate, and proud. The next experience my soul, shining brighter than ever before, is calling to it, is one of love and kindness. When in the arena this time, and daring greatly again, I will dance with garlands of flowers in my hair, holding the hands of those who love me best. I am back on the sofa, but not my usual one. The other one. My sitting room has two sofas, one by the window, and one by the door. I usually sit by the window, but Fancy Girl is here for the week, doing last minute stuff for University, and she is sitting on my usual sofa by the window, in the sunshine. I am sitting on the other sofa, and feeling very comfortable, and very gracious, allowing my usual spot to be taken by my daughter. Her needs are greater than mine, I say to myself, but what I really mean is, she was there first and has occupied it. I have come home from Bridport. The exhibition is unpacked, sorted, and repacked. The studio has been hoovered, and I have put a fluffy cushion on a chair there so I can sit and be ready for inspiration. 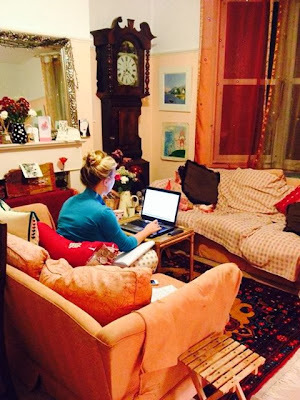 All the jobs that have to be done have been done, and now I am sitting on the wrong sofa in my sitting room, with the sunshine coming in through the window, smiling brightly and feeling faintly out of my depth. There is no time for the studio at the moment. There is a surge of lodgers moving out, and new ones moving in. Giant Boy is thinking about driving lessons. Fancy Girl is doing her last minute Uni work and I have no real space to think. I have returned from AGD in Bridport, with all the work and effort, all the rewards and engagements there, to Bognor where a different kind of world awaits me. A world where, amongst other things to do with hoovering and washing and wiping with antiseptic wet wipes, a blind needs repairing, the laundry needs doing, Giant Boy requires some proper food and the garden needs help. And so, sublime to the ridiculous. The sublime is where I am working through the A Graceful Death exhibition and project, reaching people, asking questions, understanding things, sitting with the dying, with the bereaved, with the curious, being brave. The ridiculous is dirty dishes being added to a clean dishwasher, piles of laundry, lots of bills to pay and wilted flowers in old water on the kitchen table. November has been a difficult, exciting and rather confusing month. And so, I have decided to take control. I will make December into a caring, gentle, Antonia centred event. December will be my month of space, of wilfully following my nose, of only sitting next to people who agree with and are very nice to me. There will be space, a whole 4' at least, between me and any of my children, my family, my friends or other human beings who are in the same room as me. I have a piece of wood in the studio that is 4' long, I will hold it out in front of me, so I can keep all my dealings with other people at a safe distance. I won't engage with anyone who is not at the end of my stick. "No," I will say, "you are too close. Let me poke you with my stick to a safe distance, and only then shall I deal with your communications." 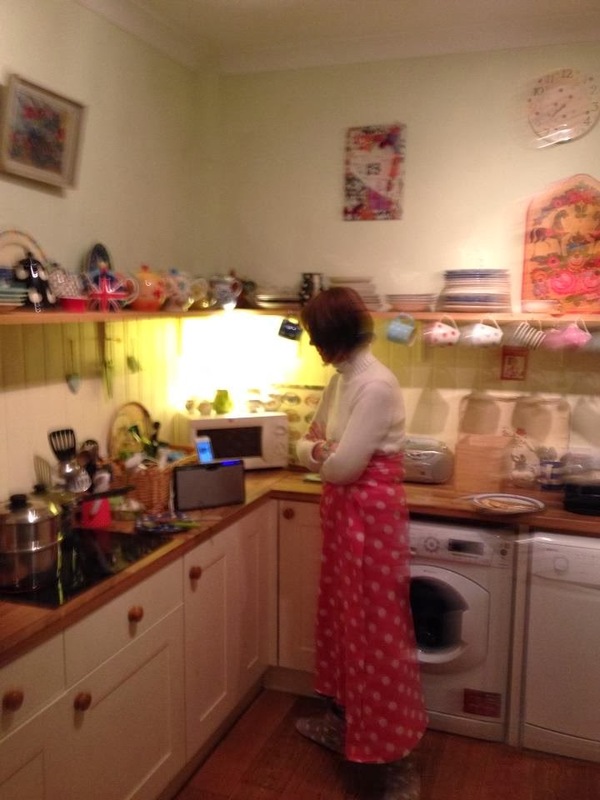 There will be space between me and the studio, between me and the cooker, between me and answering the phone. During December, I will wander aimlessly and happily around. My favourite sentence will be, "Sorry, can't hear you," and my distance stick will make sure only the most dedicated keep going until I decide to hear them. So now, I am sitting in a silent room, alone, with some scented candles and some roses. One of my lodgers moved out today, and I have occupied her bedroom. It will be a month till someone else moves in, and so, I have selected some deep pink blankets, some fresh sheets, some smelly candles and some roses from downstairs, and I have moved in. It is a bare room, which is what I want. It is really lovely in here, and I feel I may stay here until December. Fancy Girl is sleeping in my room with me, and though I adore every little hair on her head, I need some space or I may kill someone. Earlier on I did get onto the right sofa in my sitting room, Fancy Girl moved all her stuff onto the wrong sofa, which did not seem wrong to her, and we were very happy. That was a small victory, leading to the gentle but swift occupying of the spare room as the lodger was leaving. "Out of my way," I was thinking, "this is all mine now." And so it is. I am very happy in here, with the bare minimum of things and all my nice cushions and blankets. I shall do nothing until January. Fancy Girl and her boyfriend are off to Australia in December, leaving me use of their flat. I will go there to write. I may change my name in December and speak with a Welsh accent. I may get a disguise for December. I think a Fireman's uniform is a good one. If someone stops me and says, "Oh thank goodness! A fireman! I have a fire for you to put out," I will say to them, "I have a raging fire in my soul, which I need to address, and until that fire in my soul is under control, I cannot put out the fire in your wheelie bin." I don't have to come out of this bedroom until five minutes before the next lodger arrives in mid December. Garlic sandwiches are fine. It's not my problem. I have been rushing ahead full tilt, feeling, as one does, invincible and rather unstoppable. "Pile on the events!" I said to everyone, "the more the merrier!" 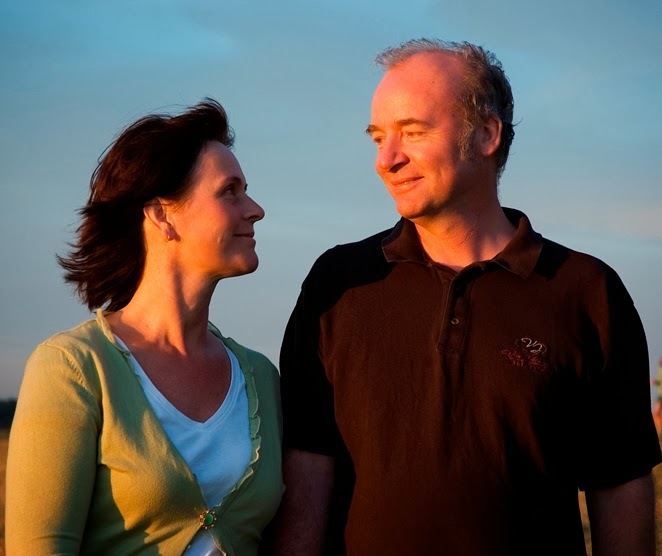 I felt robust and inspired, and imagined that it was easy to put on as many AGD events as I wanted, to continue to work with people at the end of life and run the family, deal with the lodgers, try to lose weight, and do the hoovering. It is absolutely possible to do those things, but not all the time. No, not all the time. If you decide to be a human dynamo with no down time built in, sooner or later all the springs and wheels and cogs will start to fly off and everything will grind to a bit of a halt. I have lost count of the times my friends have told me of this. I cannot imagine the amount of times I have reminded someone else of this, but do I listen to myself? Or anyone else? Do I hell. And so, my cogs and wheels have pinged off into space, and I have had to stop. Like the Duracell bunny who's battery has run out, but with more cogs and wheels. 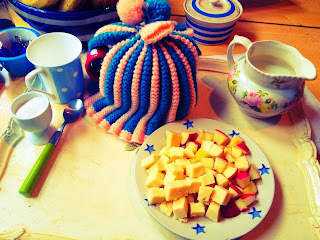 To end this small and intimate blog, I will tell you that a) I have lost over a stone and a half. I look the bees knees and will probably go mad now buying smaller clothes and wearing them at half hour intervals. b) I'm fine really. c) Both Giant Boy and Fancy Girl have followed me up here with their dinners and are sitting very close to me on the bed asking me if I want to be left alone. Sigh. AGD, the AGD Elves, Soul Midwifery and Fluffbucket. A Huge Success in Bridport. 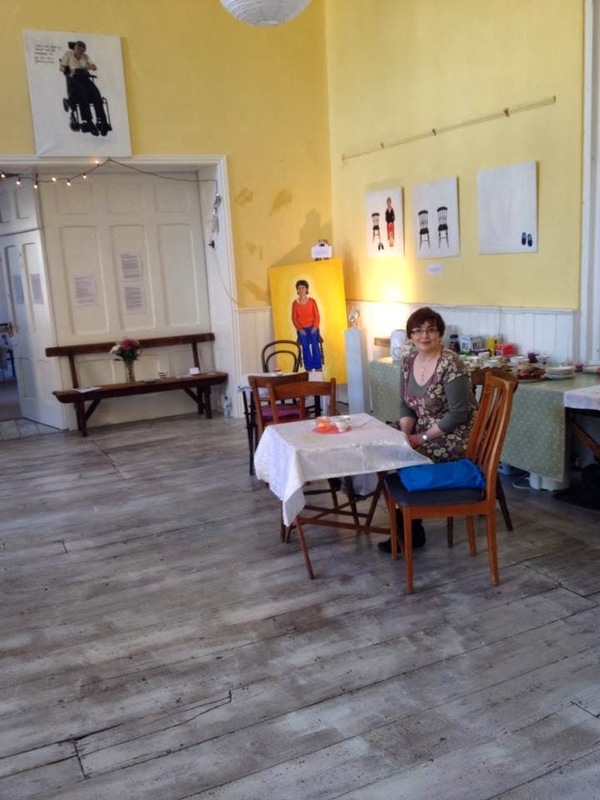 Eileen, the chief AGD Elf, sitting in a quiet moment at the Bridport AGD Soul Midwife Exhibition, at our tea tables. There was a large amount of cake, flapjacks, teas and coffees for people to help themselves whenever they wanted, helping to ground us all if we needed it. 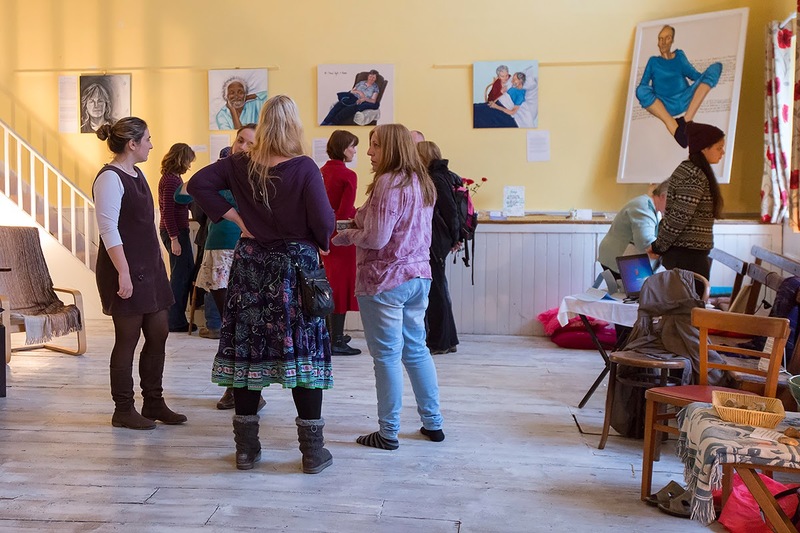 We, my team of AGD elves and I, had the most wonderful and exhausting exhibition of paintings, Soul Midwife workshops, talks, concerts, music, afternoon teas and deep and meaningful chats. Mandy Preece - for starting us all off with her Laughter Therapy Workshop. We needed this! It was wonderful! Felicity Warner - for coming to talk about Soul Midwifery, and inspiring new people in the art of gentle dying. There were so many people who needed Felicity's words, and it was wonderful to have her with us. Sarah Weller - for once again giving a sound bath that knocked everyone's socks off. For making us all laugh. Setting up for Sarah's sound bath amongst the paintings. Sarah didn't make us laugh here, it was all very serious and lovely. She just does it at all other times. She even calls Jackie "Fluffbucket." Me and Jackie, aka Fluffbucket, having a quiet moment where I tell her my Grandfather worked for Cadbury's and I and my brothers got to eat all the reject chocolates. This is the moment I told her Grandad brought home square cream eggs. Taken by Eileen, this is actually a still from a lovely little film she took of us having a chat in a lull at the exhibition. A steady stream of people came to the exhibition, and there was much to talk about. Our workshops took place downstairs in the White Room, where we had decorated it to look warm and welcoming. There were sofas, colourful cushions, lights, candles and some of the more gentle and less challenging AGD paintings. This is where Jade recited the poetry, I gave a talk on what I do, Lizzie played her concert, Mandy gave her Laughter workshop and Felicity did her Soul Midwife talk. The exhibition over the weekend, taken by Eileen. I will tell you, in a minute, of the experience of one of our visitors. There was more than one result for the exhibition in Bridport. The effect of the paintings is always important with the feelings, responses and emotions that the exhibition stirs up. We care greatly about this, and try to give time and space to those that may need it, and to listen to those who want to talk. At this event, there was the added bonus of the Soul Midwife connection. The joy of the Soul Midwives meeting each other again, to do their workshops and talks, to visit the exhibition for the first time, to catch up on each others news, and to have Felicity who started it all with us, was wonderful to see. It was a powerful exhibition because of input of the people involved. Everyone was able to offer something profound, which added to the atmosphere. Death and dying is not an easy subject, the paintings are challenging and some of the stories are really sad. The films we show are true and real, and make us stop and think about how precious our lives are. There is much love and life too, in A Graceful Death. There is even laughter and joy. The presence of the Soul Midwives, those who worked over the weekend with me, and those who came to visit, lifted the spirits of all who came and raised the energy of the whole event. Before the exhibition began, I was contacted by a lady I had never met. She told me she was coming to make a weekend of it. At the opening event, she introduced herself and after a while, told me that she was coming because she needed to bridge a gap between the last few weeks, at home, after suffering a miscarriage, and going back to work. She loves her work, but felt that her miscarriage had taken her into a separate and private world of grief and sadness, and she was not sure how to move on from there. She told me she would take from the weekend what she needed, and that she would know what that was. I was very moved by her sadness and bravery. This lovely young woman attended everything on the Friday and on the Saturday. After Felicity's talk on Saturday afternoon, from which she gained a great deal of comfort, I asked her how she was. She told me that she was ready to make that transition. She had, she said, created the perfect life inside her, and then had created the perfect death. She miscarried the baby at home, over some time, and she and her husband gave it a Viking funeral. I asked her why she had come to such an event, after experiencing such a terrible thing. I told her that she was very brave. She replied that she had been afraid of being with other people's pain, but had come anyway. What she had wanted was to link everything, her experience of loss, of work, of life, and grief, back to work again. Her miscarriage, she said, was the loneliest grief. You cannot prepare for it. She had known that she had to come, and was willing to see what she would learn. After Felicity's talk, my lady had taken huge comfort and had felt that she had created both life and death, and honoured both, and that she had an innate knowing about death that she could tap into. And instead of finding herself afraid of experiencing other people's pain at the A Graceful Death exhibition, she had found it a place full of love and warmth. My new friend finished by saying that she was aware of a heart and mind connection, and at the moment, she was able to leave her head space to live in a heart space, and work from there. After two days, she decided that she had got what she needed, and left. I asked if I could use her story for the address I was giving the next day, Sunday, at the Unitarian service, and she agreed. I think her story is a very poignant example of how A Graceful Death can work. It can be what you need. This time, there were a good many of us who had worked with the dying, and the bereaved, and were able to create a safe space for those who needed it. I am grateful to this young woman, and send her love. Maybe, I will put a little pot of flowers dedicated to the baby at the next exhibition. I don't think she will mind. She told me the name of the baby, and I will name the flowers for the little one. 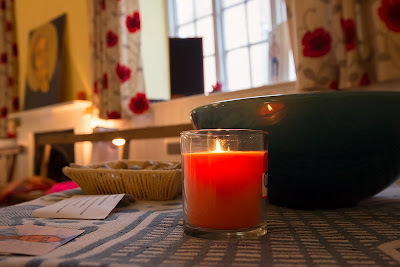 Candle by the Prayer and Memory Bowl at Bridport AGD Soul Midwife Exhibition last week. Taken by Eileen. 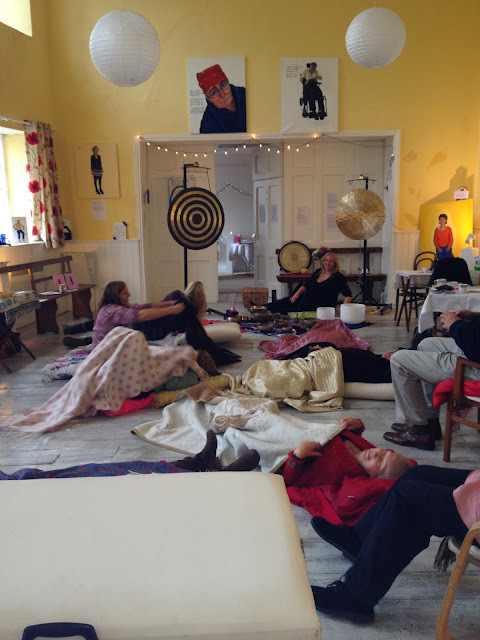 A Sound and Toning workshop on Saturday 16 November from 2 - 4 pm, afternoon tea afterwards with discussions and talking. £10 for the afternoon. 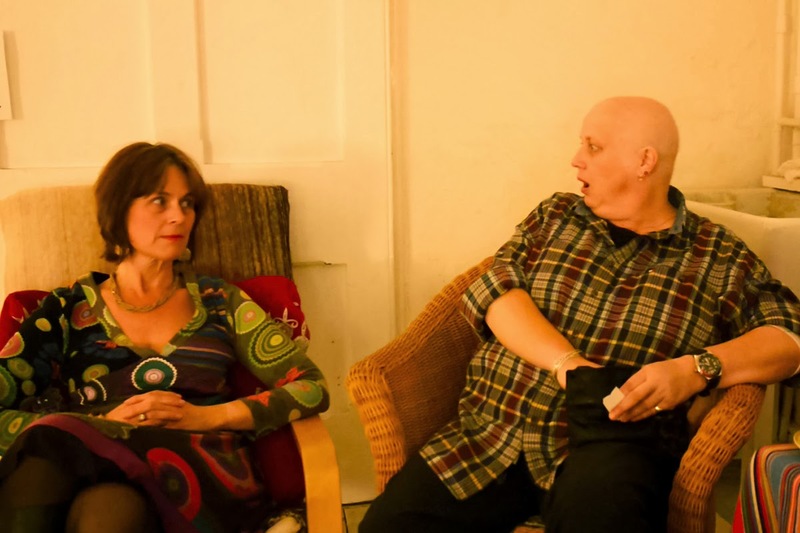 One to One Astrological Soul Readings on Sunday 17 November. Each session is 45 minutes long, and very focussed on you. You will understand so much about who you are, Sharon's Soul Readings are amazing and enlightening, and Sharon herself is deeply perceptive and intuitive. Her Astrological Soul Readings are always very popular. Contact me on antonia.rolls1@btinternet.com to book your session. Each session is £35. Sessions start at 11am. Book soon as Sharon will only be able to do up to five sessions, as they are long and intense and wonderful. And there is tea and cake included, as usual, all the time. 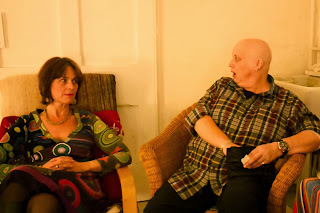 "Sharon Galliford MSc a Transpersonal Psychologist and Sound Healer. Her work is rooted in her love of understanding the connections we all have to our inner knowing and intuition. She has a passion for assisting people through these tumultuous times as they realign themselves to the changes taking place in their lives. Sharon runs regular facilitated support groups, workshops and private client sessions in Lightwater, Surrey. " 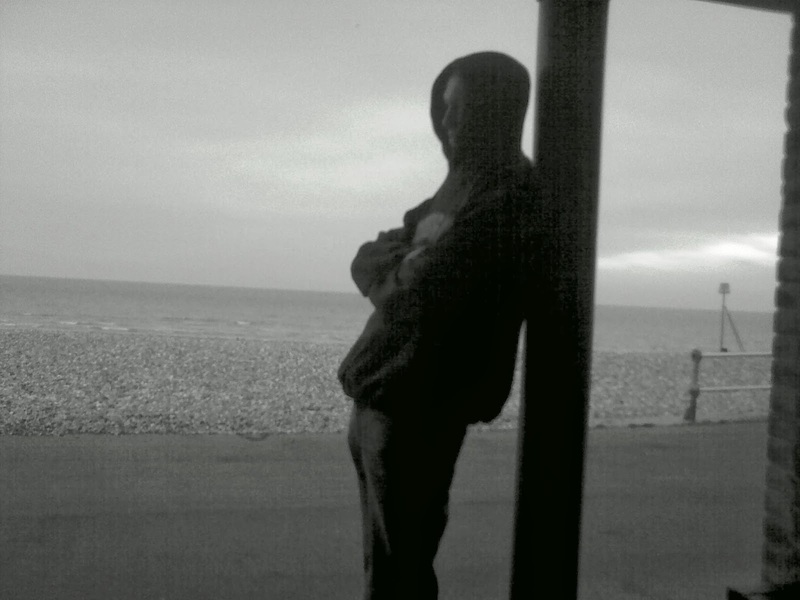 This weekend of Sound and Toning, and of Astrological Soul Readings is held at my home in Bognor Regis. Email me at the above address to book your place at either or both of the workshops. A donation from the proceeds will go to A Graceful Death exhibition and project. I am very grateful, thank you. I want to leave you with a small clip of Jane playing her harp in the exhibition area. She plays it so gracefully. It added a certain something else, something poetic and lovely, to the afternoon, and you can tell by the way everyone is tucking into the tea and cakes, that they think so too. Jolly good harp, they are all saying. Gives one an appetite. And finally. The day Eileen and I left for Bognor Regis again, the car died. A death of a different kind, and before we could get out and film it, the AA arrived and put in a new battery. So the car got away with a near death experience, and did not have to join the exhibition after all.